Coming off of this summer’s abysmal adaptation of The Dark Tower, Stephen King fans have reason to be weary. King’s novels can be difficult to adapt to the big screen, both too sprawling and other-worldly to see play out with your standard issue director without seeming broad or cartoonish. But IT, as a project, held some promise in the early days. 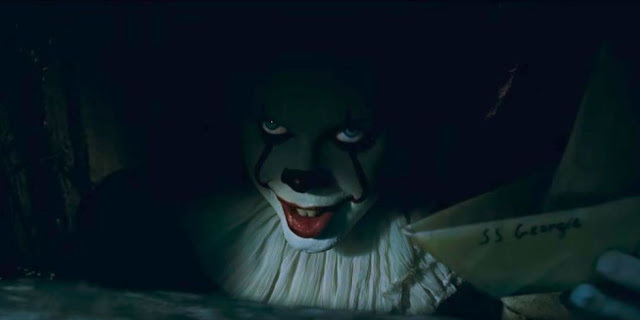 The film had landed director Cary Fukunaga straight off of True Detective Season 1 fame, and clowns were randomly showing up everywhere, freaking people out on the streets and showing up in the news. Were we finally ready for our Big Clown Moment? Sadly, it was not to be. Fukunaga left the project under the oft-cited cloud of “creative differences.” He was instead replaced by the filmmaker behind the horror dud Mama, Andy Muschietti. It’s hard to say how much of Fukunaga’s vision remains in what we see on screen now, but what we’re left with certainly seems like the product of reactionary studio thinking. That, of course, does not indicate that the film is a failure. But it feels like IT has been defanged a bit in order to appeal to the flavor of the moment: in this case, 80s nostalgia. The plot of the novel is more or less maintained, with a few choice alterations (the fate of a character here, added backstory there), but the most significant alteration is the transplanting of the main narrative, which focuses only on the story of the protagonists in their youth, saving their transition to adulthood for a potential sequel. While the first half of King’s novel takes place in the 1950s, the film adaptation moves that timeline forward to the late 1980s, complete with New Kids on the Block references and music from bands like The Cure. It seems like a move to position the sequel in a modern day setting, though the story remains very suburban 50s, which makes the 80s environment feel a little forced. To be clear, IT is actually a really funny movie with an intriguing coming-of-age adventure. The young stars of the film are well-cast and have a natural, breezy chemistry that you would expect from a close group of friends. The problem with IT’s screenplay is more related to plot than dialogue. Horror films do not necessarily have to be scary to be successful, but they should when they spend a large amount of time attempting to incite terror in the audience. IT devotes a significant chunk of screen time to setting up character fears and then going through the motions of trying to trigger jump scares from those fears, most of which are so poorly put together they feel reminiscent of a low budget haunted house. Bill Skarsgard, who plays Pennywise, is incredibly effective in moments when he’s simply speaking to and interacting with the children he’s trying to scare, but in the peak of those moments, Pennywise is often transformed into a CGI mess, undercutting his menace significantly. The most boggling question I have about IT is why it stuck with the R-rating, which feels like a leftover relic from the movie Fukunaga was trying to make, but no longer belongs in the comedic adventure story we end up with. Subtract a few swear words and a violent scene in the first half, and you’re back into PG-13 land, presumably, because nothing in the horror realm of the film feels like it deserves the rating. It might seem silly to compare this film to Netflix’s Stranger Things, which was obviously inspired by IT, rather than the other way around, but it’s hard not to when one of the main cast members (Finn Wolfhard) shows up on screen. If you liked the tone of that show, you’ll find plenty to enjoy here. But in many ways Stranger Things did a better job at being that coming of age romp that this iteration of IT could only half-commit to in the amount of time it had.